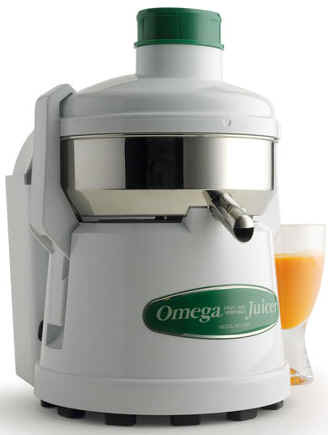 The Omega Model 4000 is Omegas NEW Pulp Ejector style continuous Juicer. The Classic Looks of the Model 4000 will look attractive in any kitchen, either home or business. The simple touch of White Lustran Plastic and Surgical Stainless Steel is a look that will never change. Motor: The 1/3 Horsepower 5200-Rpm Permanent Magnet Motor is the most efficient motor you'll find in a juicer. That equates to less energy consumed every time you juice. This motor has tested so well we Omega is backing it with a 15-year warranty. White Top: The top for this juicer has been painstakingly designed to achieve stylish looks while staying completely effective. This patented helical design reduces the chance of pulp from gathering in the chute and the juicer not clogging up. Most entry-level juicers will clog after processing just a couple of pounds of fruits and vegetables. Wing Nut: The blade and basket assembly is held together by a white plastic wing nut. This wing nut is large enough to be tightened and loosened by hand without the need for tools. There are no little screws, nuts, or washers that can be lost. Rubber Feet: Your new juicer will stand on a dozen evenly spaced feet. These feet are variable in height, which will help the unit keep from "walking" across your counter top. Yet soft enough to give the juicer traction while not marking up your counter top. 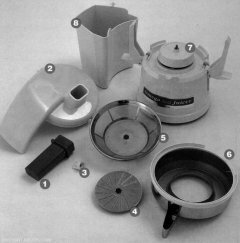 Feed Chute: The chute of this juicer is large enough to accommodate large pieces of fruits and vegetable. The larger chutes of other juicers may slow down the motor when too large of an item is pushed down. Warranty: The Omega Model 4000 carries a 15-year warranty.